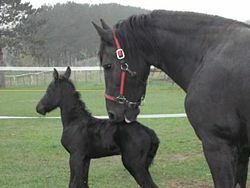 The Friesian or Frisian horse is one of the oldest breeds of domestic horse in Europe and has had an influence on a number of other breeds. Its homeland is in the northern Netherlands in Friesland, where its ancestor is believed to have been found. Being introduced to the Netherlands during the time of the Crusades had a great effect on the breed as did many other horses. Because of this the Frisian is what is called an all-rounder; meaning it can work in the fields as a draft horse, pull a carriage through the streets, recreational or sport riding, and show. The Frisian is very useful as a riding horse because of its desirable high trot. This led to the horse being interbred with other high trotting horses during the nineteenth century. Thus its build became lighter and the Frisian became less suitable for a farm horse. By the beginning of the World Wars the original breed's numbers had been greatly reduced. However, due to lack of fuel during World War II, the breed was revived as its fortunes as farming horses returned. Usual height- 15-16hh.(hands). Horses are measured in hands, one hand being equal to four inches. The measurement is taken from the ground level to the highest point on the horse's withers. This page was last modified on 14 August 2014, at 19:24.